Title: 'Nova Totius Terrarum Orbis Geographica ac Hydrographica Tabula'. 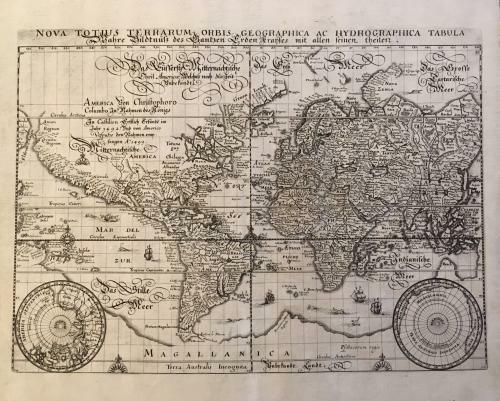 An elegant world map presented on Mercator's projection with cartography closely copied from Blaeu's world map of 1606. The Latin title is printed at the top, outside the neatline, with a German gothic script title and notation, concerning the discovery of the Americas in 1492, which covers the unknown interior of North America. There is a large southern continent connected to New Guinea, California is a peninsula, and there are plenty of open ended waterways in the eastern part of North America, which leave open the question of a Northwest Passage. Two polar projections in lower corners partially obscure the great southern landmass. The map is finely decorated with sea monsters, galleons and compass roses.